It was one of the more eventful Mothers' Days in a long time. I woke up about 7:30, but I spent an hour in bed watching Betty White on SNL. Man, I love it. Good times. Good times. Just as I was finishing "Weekend Update," E came in and whispered that I needed to stay in bed. I guessed at what was up... for the first time, the kids have been really excited about Mothers' Day. I heard some scurrying around outside, and pretty soon these two cuties showed up with French Toast, my favorite breakfast. They get bonus points for learning how to make it out of one of Roo's cookbooks. I love them. What good kids. They didn't need to make me anything, I just love being their mom so much. I know. Sorry. Too far, P. But they're just so easy right now, I can't help myself. Cuties and toast. So what if the powdered sugar got everywhere? So did the love. After dragging around like lazy bums all morning, we got in the car and headed up to see E's folks. Here's a little slice of H and E for ya. Well actually, you should probably see the birthday message E taped for me when I shoved a camera in his face (from the other day) first. You might not want to watch it if you don't like people flipping each other off, but it's nothing terrible. The kids got to play with an old tea set from one of E's cousins. Guess who was the most interested in it of the two? We finished up the evening with a YUMMY BBQ at my parents' house with my grandparents and aunts and uncles. 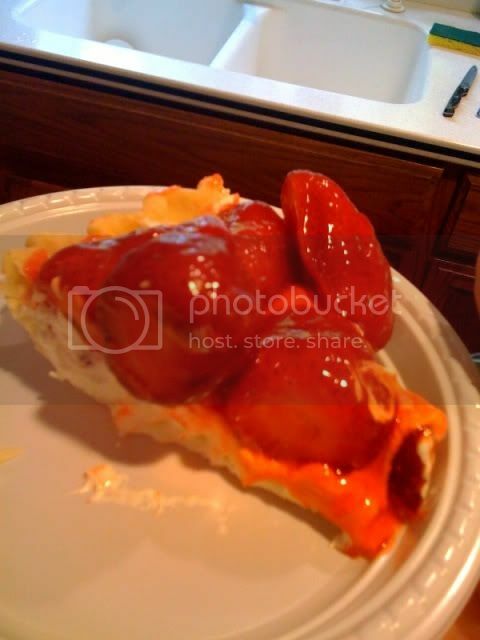 I even got a slice of my favorite pie in the whole world. If you're nice to me, I might post the recipe. And I managed to catch my grandpa playing paddycake with the kids. He used to do this with me and Lis when we were little--always told us to do it then made us "miss." We used to laugh and laugh just like Addie. I'm so glad I caught this tonight. Happy Mother's Day! Looks like you had a beautiful day despite the rain! Your day looked like fun!! And even though I haven't seen E is like, 15-ish years, he seems like he hasn't changed. :-) You have a wonderful family, and that french toast looked bomb! That grandpa video is ADORABLE. Your kids are ADORABLE. Is grandpa like 62? He looks like a pretty young whippersnapper. Happy Mother's Day. 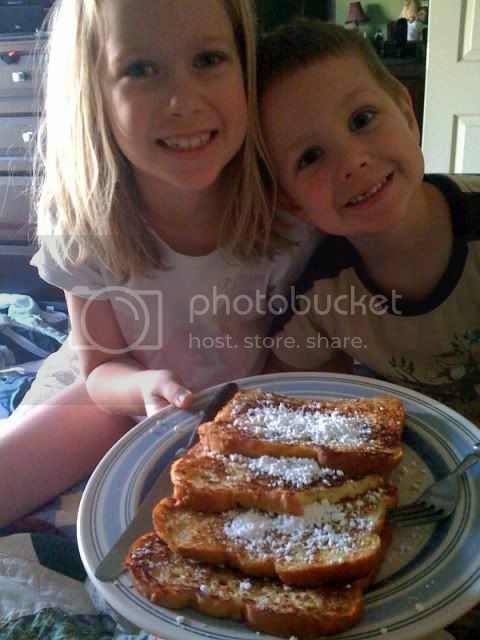 Your kids are adorable, and the french toast looks yummy! Not much of a title, actually.